Hello world! I’m baaacckkkk~ And finally able to spend some time in my own kitchen again! For those of you who may not know, the past few months I’ve been working first as a garde manger line cook for the main dining room at the one-Michelin starred NoMad restaurant before being selected to join their bar team (responsible for one of the best burgers in the WORLD according to Bloomberg). Not taking Chef up on his offer to join the team after my ICC Externship and making the conscious decision to leave the restaurant and not pursue a career as a professional chef is bittersweet. For me, although I loved working in the kitchens of a fine-dining restaurant (one that’s also internationally known for its chicken), I also love life. And unfortunately life and being a part of society AND having the time to put into the relationships that I deeply care about just wasn’t feasible for me with the hours I was working. Let’s be real, we’ve all heard that work-life balance as a cook is pretty much nonexistent, but that was something I didn’t truly understand until I was one. Even on the occasional Mondays or Tuesdays that I had off of work, I didn’t spend the day frolicking in the sun as I thought I would, but instead slept in before spending the rest of the day nursing cuts, burns, and sore muscles – symptoms that somehow miraculously disappear though as soon as I put on my kitchen clogs and chef’s whites. There are many factors that went into this decision, but in the end, I just wasn’t willing to sacrifice enough to pursue what I had thought was my dream career. So although I am a little lost right now, at least I know that I am in the right field and hands-down want to continue working with food. Tomorrow I will be flying out on an adventure to Vietnam to spend some time with two of my loves, but when I’m back, you will find me sniffing the streets of NYC for good food and my next culinary journey! For now though, I’m finally back to functioning on normal daylight hours, and back with a bowl-geance. 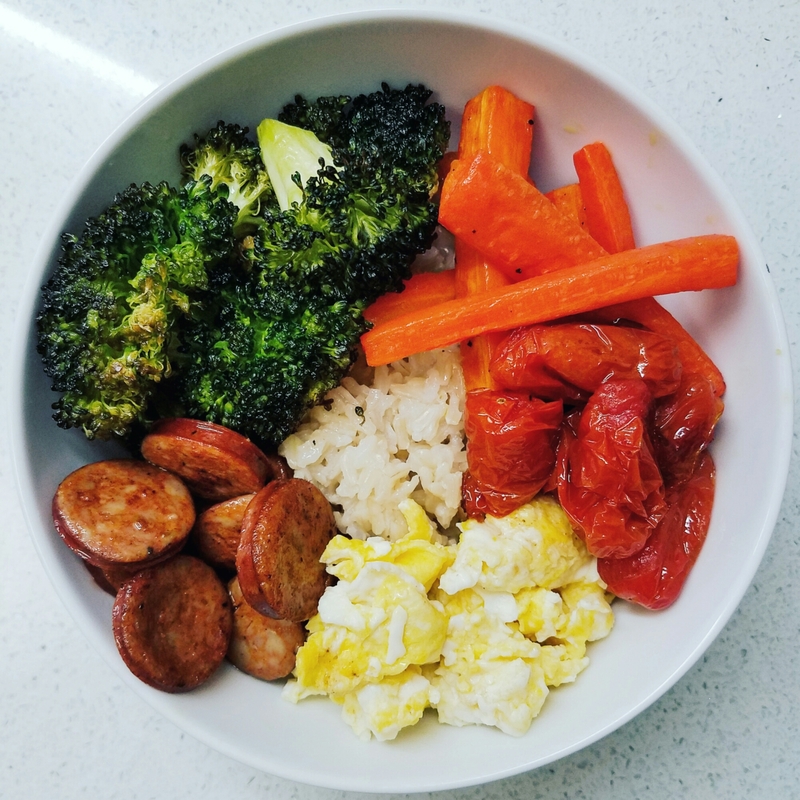 Please continue reading for the recipe for this dinner bowl featuring brown rice, roasted carrots & broccoli, seared sausages, scrambled eggs, and semi-dehydrated plum tomatoes.